April 27th Show : Blog Of The Nation In our first hour, Obama's first 100 Days, and the opinion page with Sen. Arlen Specter. In our second hour, questions and answers about the swine flu outbreak, and Christopher Durang on "Why Torture Is Wrong and the People Who Love Them". This week marks President Obama's 100th day in office. It's a day of reckoning of sorts, where the media and the public evaluate the president's successes and failures, and assess how well he's delivered on his campaign promises. In our first hour, we'll talk with NPR correspondent David Greene who has just wrapped up a 100 day cross-country road trip talking with Americans about the president and the economy. We'll also be joined by David Gergen, professor of public service at Harvard's Kennedy School of Government, for his assessment of Barack Obama's first 100 days. Then, we'll talk with Senator Arlen Specter (R-PA) on our opinion page at the end of the hour about why he wants to roll back presidential powers. 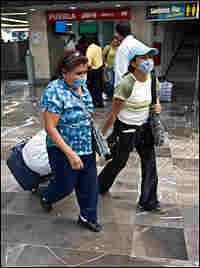 Some governments around the world are bracing for a possible swine flu pandemic, and President Obama's administration is closely monitoring the growing number of cases that are emerging across the U.S. and in Mexico. In our second hour, health experts will answer your questions about the swine flu outbreak and tell you what you need to know. Then, actor and playwright Christopher Durang will talk about his latest production, Why Torture Is Wrong, and the People Who Love Them, a play about terrorism and torture... that's surprisingly funny.